I did not expect much out of the training here in Mumbai. (By the way, TTT stands for Train-the-Trainer.) But what I went through today was quite spectacular. I have learnt how to be a presenter, albeit conciously or unconciously, almost all my life, since I grew up in the church environment. But what I learnt today about being a good presenter were really good learning and reminders. 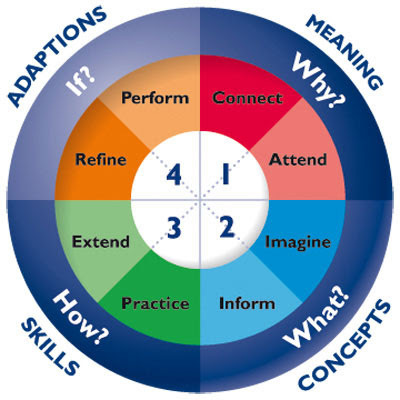 One the things I find quite brilliant is the 4-Mat learning model. It basically divides preferences of learners into 4 categories - the Why Learners, What Learners, How Learners and the What-if Learners. I see myself as a Why and a What Learner. My left side of the brain with the Attend and the right side with the Imagine - I think, since this picture here shows that there is more than what was being introduced during the training session. I believe that all quadrants are important. As much as I learn best in the why and what, I also need to know the how and what-if. But what I can gather is that this is only applicable in a learning context - how one prefers to learn. Being a Why and What Learner, I now understand why I refuse to learn sometimes and the fact that I really dislike things like role playing, debates, "just do it", pass/fail grading, timed tests and computer assisted instructions (ooh, how I hate these!). Click here for more information on 4-Mat. Click here to view some pictures I posted for the day.